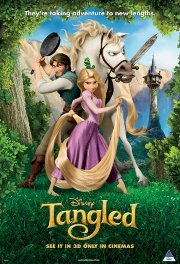 Disney gives us their take on the Rapunzel fairytale. She is a princess stolen from her parents' castle as a baby, and locked in a hidden tower by an evil witch. Now as a teenager, she takes off on a hilarious, hair-raising escapade with the help of a dashing bandit. With the secret of her royal heritage hanging in the balance and her captor in pursuit, Rapunzel and her cohort find adventure, heart, humour, and hair... lots of hair. This film is releasing in both 2D and 3D, this is the 2D version. Animated, Comedy, Family, Fantasy, Kids, Musical, Romance. Comments Some dramatic threat with midly scary creatures. Parental guidance or accompaniment recommended.